We get honest, and random, and randomer in this episode. Christopher and Andrew admit a sad truth about podcasting. We celebrate the comedic genius of the great Gene Wilder. We recognize a recent achievement by a gaming community and Christopher has high hopes of an upcoming expansion for the Addiction Machine, I mean, “World of Warcraft”. Andrew watches an all-time film-making classic “Seven Samurai” and is mostly better for it. Patrick slows down on “Abbadon’s Gate” and Chris says the tragic “B” word about a comic book we all expected to be stellar. Trivia this episode is Olympic themed. Remember when those happened? 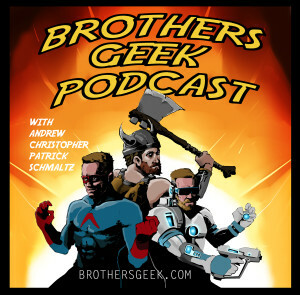 This entry was posted in Podcasts and tagged Gene Wilder, Legion, Seven Samurai, World of Warcraft on September 5, 2016 by BrothersGeekadmin.